Even though the stock market trades at near record highs, joblessness suppressed at decade lows, and corporate buybacks/profits booming via Trump’s tax reform, poverty is exploding all over America. One of the primary objectives of the Federal Reserve’s monetary policy of this past decade was to generate the “wealth effect”: by artificially driving valuations of stocks and bonds to nosebleed valuations, American households would feel more prosperous, therefore, be more inclined to borrow and spend, even if some households did not own financial instruments. In other words, a Central-Bank-free-money-anything-goes-induced ‘economic recovery’ was supposed to trigger fast-paced economic growth, as households would reignite the service-based economy. While this perception management only worked for the wealthiest households who owned financial instruments, the reckless monetary policy of the Federal Reserve created a massive problem of wealth inequality among Americans. 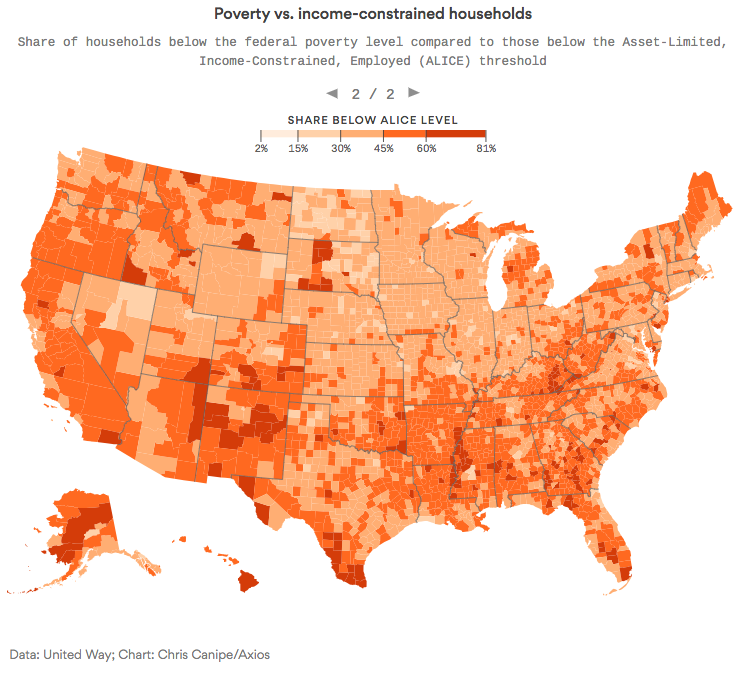 The study, conducted by the United Way ALICE (Asset Limited, Income Constrained, Employed) Project, a nationwide effort to quantify and describe the number of households that are struggling financially, discovered “a wide band of working U.S. households that live above the official poverty line, but below the cost of paying ordinary expenses,” said Axios. Axios reminds us that for two-years, U.S. politics has been overwhelmed by the anger and resentment of a self-identified abandoned class of people, dubbed the “deplorables,” a group of millions of Americans who have been left behind economically and forced into poverty. According to Hoopes, the United Way research report will be fully released on Thursday, which suggests that the “deplorables” are a much larger group than many have anticipated — and growing despite the stock market trading at near record highs. 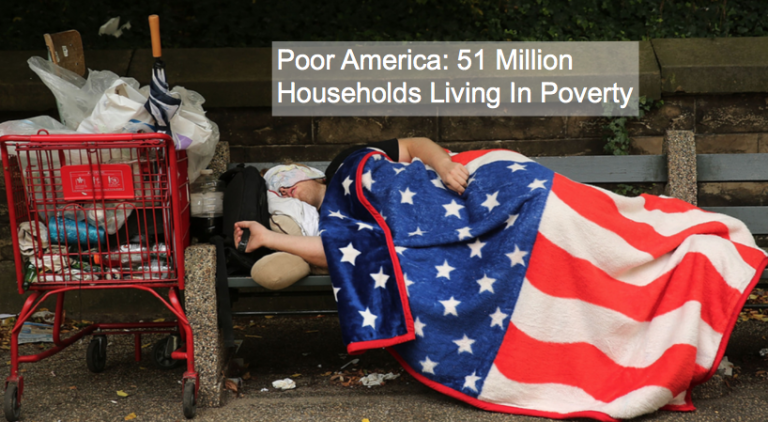 Axios said when you add them to Americans living in poverty, it comes out to a stunning 51 million households. “It’s a magnitude of financial hardship that we haven’t been able to capture until now,” Hoopes said. 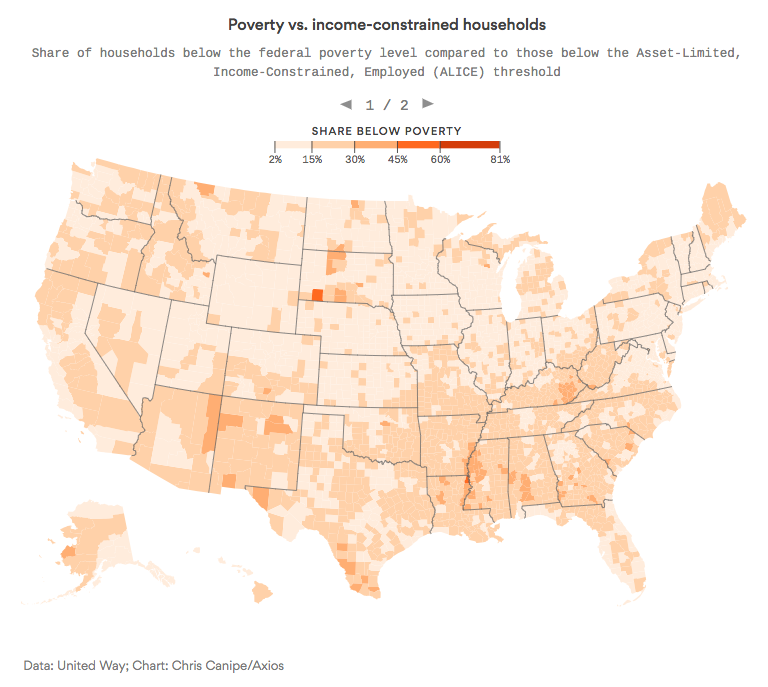 Using 2016 data collected from the states, the study found that North Dakota has the smallest population of combined poor and ALICE families, at 32% of its households. The largest is 49%, in California, Hawaii and New Mexico. “49% is shocking. 32% is also shocking,” Hoopes said. Last month, President Trump wrote an op-ed in USA TODAY titled “America’s Economy is Back and Roaring and Its People Are Winning.” For the sake of America’s survivability, let us hope that Axios is wrong about their assessment of the middle class and Trump is right; otherwise, this is just more evidence that suggests the implosion of America’s middle class.